Retailing is now perceived as the most important branding tool and the best contact point at which the brand concept can be delivered to the customers, and it is becoming more important than ever. Retail Brands should represent the values that the customers can receive through a unique experience. However, duty free shops still have a strong tendency to depend on a company’s reputation, market position, brands, and facilities, rather than on the retail brand’s own value. 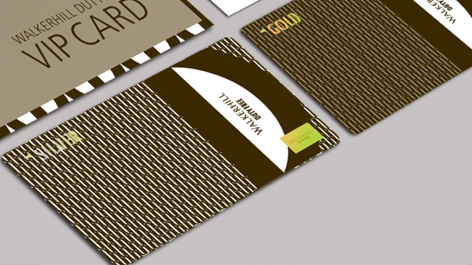 The main objective of the project was to assign a certain value as a retail brand and identify ways to visually deliver such value to the customers. Walkerhill Duty Free Shop is located in a unique place at the center of Seoul which provides a rich nature experience. This allows Walkerhill Duty Free Shop to differentiate itself from other duty free shops, since the customers can enjoy a relaxing shopping experience, rather than shop as if they are pressed for time. In addition, at Walkerhill, Sheraton Walkerhill Hotel, which symbolizes the 60s, and W Hotel, which is an icon of modern culture, stand side by side, and they also uniquely harmonize both past and present. 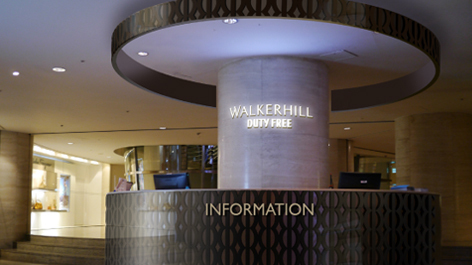 This represents Walkerhill Duty Free Shop’s shopping value embracing warm and friendly services, as well as new and trendy brands and products. 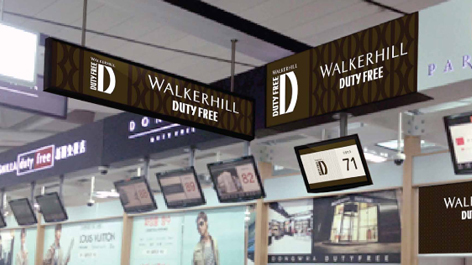 Such value concisely reflects Walkerhill Duty Free Shop’s brand concept ‘Retro to Modern’. We expressed a new image through a logotype (watermark) and patterning each initial of ‘Retro to Modern’. 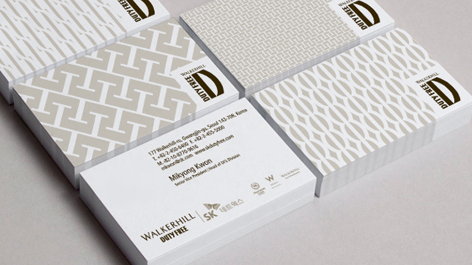 The application of various patterns can maximize the visual experience of the brand image which integrates both the 60s’ retro and modern images. 리테일은 이제 고객에게 브랜드 컨셉을 전달하는 최접점에 위치해 있는 가장 중요한 브랜딩 도구로 인식되고 있으며, 그 중요성은 더욱 높아지고 있다. 유통 브랜드는 고객이 느끼는 차별화된 경험이 주는 가치를 상징한다. 그러나 면세점은 아직 자체적인 유통 브랜드로서의 가치 보다는 모기업의 후광이나 입지, 판매 브랜드, 시설 등에 의존하고 있는 성향이 강하다. 워커힐면세점이 유통브랜드로서 어떠한 가치를 가지게 하고 고객에게 그 가치를 어떻게 시각적으로 전달할 것인가가 프로젝트의 핵심이었다. 워커힐 면세점은 서울 도심에 위치하면서도 풍부한 자연을 경험할 수 있는 독특한 입지에 위치해 있다. 이것은 고객들이 쫓기듯 쇼핑하기 보다는 여유로운 쇼핑 문화를 경험하도록 할 수 있는 Unique한 차별점이다. 또한 1960년대를 상징하는 쉐라톤워커힐호텔과 가장 트렌디한 현대 문화의 아이콘인 W호텔이 나란히 서 있는 워커힐은 과거와 현대를 동시에 느낄 수 있는 독특한 특징을 가지고 있기도 하다. 이는 익숙하면서도 따뜻한 서비스와 새롭고 세련된 브랜드와 제품이 공존하는 워커힐면세점만의 쇼핑 가치를 상징한다. 이러한 워커힐면세점의 가치는 ‘Retro to Modern’이라는 브랜드 컨셉으로 축약된다. 우리는 ‘Retro to Modern’을 워드마크인 로고타입과 각 이니셜의 패턴화를 통해 새로운 감각의 이미지로 표현하였다. 다양한 패턴의 운용은 60년대 Retro와 Modern한 이미지를 모두 내포하는 브랜드 이미지의 시각적 체험을 극대화한다.